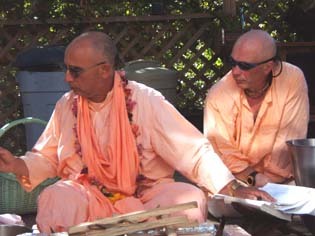 Srila Bhakti Sundar Govinda Dev-Goswami Maharaj is a reservoir of never-ending nourishment. 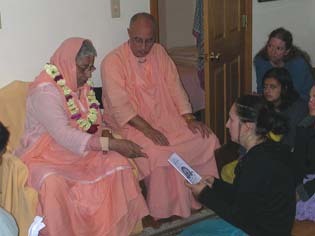 This morning several devotees from Utah and Santa Cruz were given Harinam initiation by His Divine Grace. It was the sweetest ceremony I have ever observed. They started at 8am. Gurudev addressed each person with so much affection. 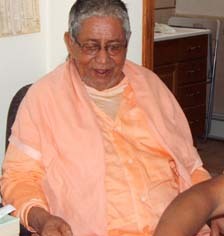 Afterwards, Srila Gurudev gave Gayatri initiations in his private room. Several devotees waited on his veranda and chanted for about 20 minutes. Suddenly, Srila Gurudev began to sing very sweetly. He lead kirtan for about 5 minutes while we followed, clapped, and listened to his transcendental melodious voice. 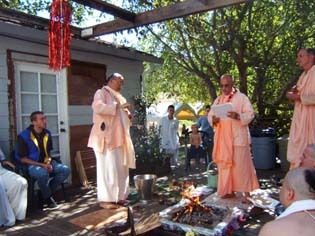 He gave each initiate beautiful new names: Gaurangi Dasi from Utah. 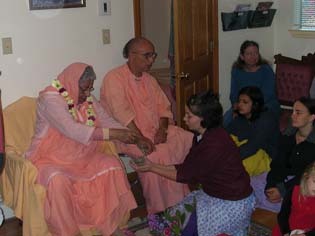 Laksmi Priya Dasi from Utah. 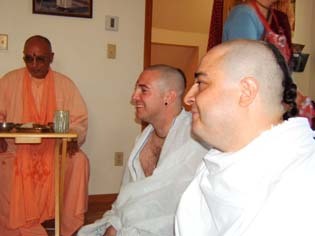 Arindam Krishna Das and Jivana Krishna Das after receiving the Gayatri Mantra. Later on, the fire sacrifice commenced. 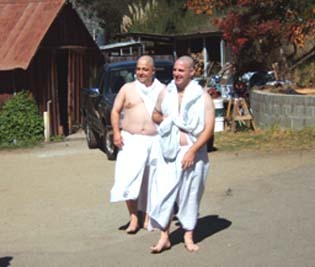 The brahmans went outside to collect donations from all of the devotees for their spiritual master. 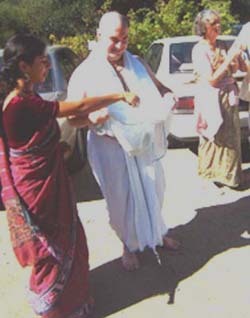 Jivana Krishna Das receives many donations. 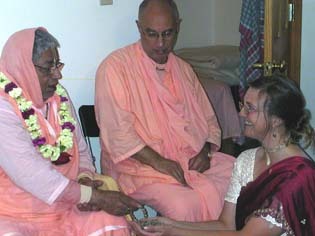 Arindam Krishna Das receives a donation from Vrndavanesvari Dasi. 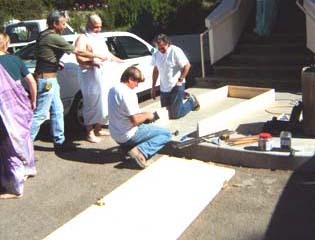 In the meantime, Bahulavan Prabhu and Srutasrava Prabhu work on construction for the new media office. Chanting for the fire sacrifice. 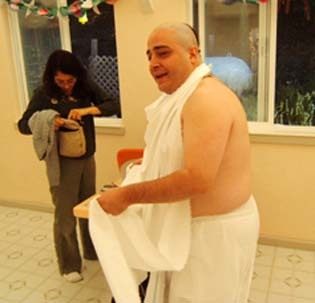 Parvat Maharaj carefully puts a dab of ash on everyone's foreheads. The brahmans left to offer their donations to Srila Govinda Maharaja's holy feet. Srila Gurudev had a very happy look on his face. 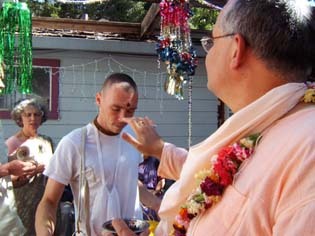 He briefly spoke to the devotees about the ceremony and then it was time for prasadam. 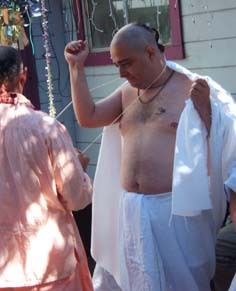 All Glories to Srila Bhakti Govinda Dev-Goswami Maharaj!